Design for fast and easy installation, EZ Fit will allow you to easily replace your existing fan in 40 minutes entirely from the room side no attic access is required! Imagine breathing easy, knowing your family is in a well-ventilated home, free of mold, mildew and indoor pollutants. The Cyclone HushTone CB150HL offers an exceptional combination for eradicating these problems. The humidistat senses increases in humidity and automatically turns the bath fan on regulating the moisture levels in the air for optimum comfort. Built-in light for extra illumination without the need for an extra electrical connection when spacing is limited. Exceptional ventilation is vital to protect your home and family from mold and mildew caused by moisture, unpleasant odours, and even poisonous gases like carbon monoxide. Modern homes are now built to be more energy efficient and are thus more tightly sealed, keeping in heated and cooled air, but also harmful airborne pollutants. Eradicate these problems with the incredibly quiet and powerful Cyclone HushTone bath fan. Imagine breathing easy, knowing your family is in a well-ventilated home, free of mold, mildew and indoor pollutants. Comes with a light for extra illumination without the need for an extra electrical connection when spacing is limited. The easy to operate fan and light of the NuTone 50 CFM Bath Fan provides efficient air circulation and up to 100Ws of light. The 50 CFM speed and high-efficiency impeller makes it ideal for small to medium sized bathrooms. The classic white look compliments any style design and decor. 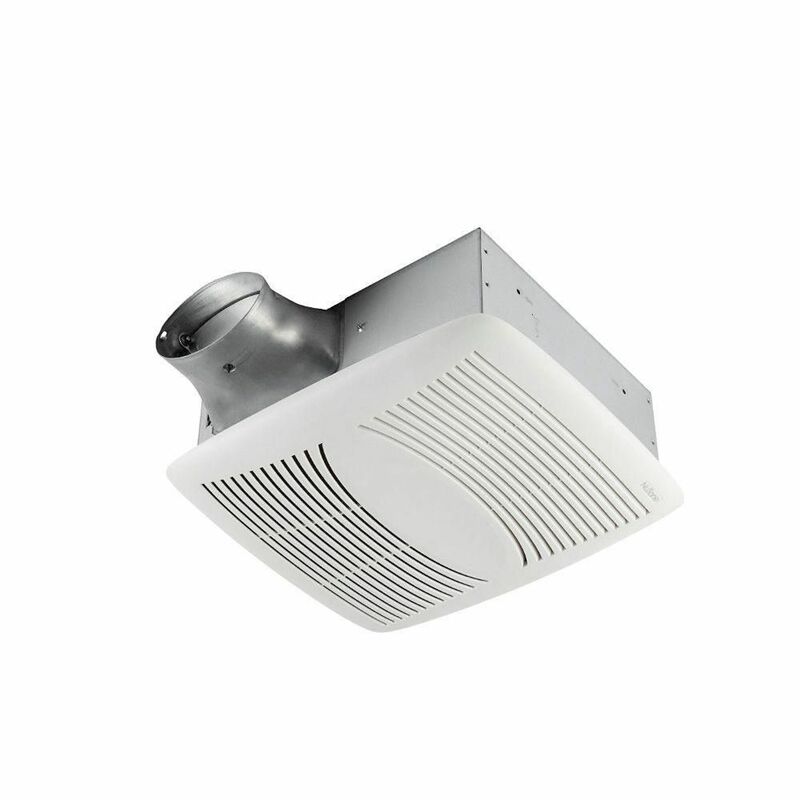 Known for quality and durability, this Value Test exhaust fan from Broan-NuTone is the prefect solution for removing moisture from a room up to 50 square feet in size. And with a sound rating of 3.0 sones, you won't have to worry about excessive noise. Plus, the attractive white polymeric grill blends well with any home decor. EZ Fit Ventilation Fan - ENERGY STAR® Design for fast and easy installation, EZ Fit will allow you to easily replace your existing fan in 40 minutes entirely from the room side no attic access is required! EZ Fit Ventilation Fan - ENERGY STAR® is rated 4.0 out of 5 by 7. Rated 4 out of 5 by Gordon from Easy retrofit install I chose this fan specifically because I needed to replace an existing fan and needed something EASY to install. Plus, my bathroom is in the basement, so no access from above, so I had to be able to access everything from below. This fan is very intelligently designed for retro installation, the drywall tabs work great and the instructions were excellent. Took me about an hour. It's quiet enough for my needs, and much quieter than its 20 year old predecessor. I thought it was a bit pricey, but probably worth it to save hours of aggravation. I also have the same complaint as other reviewers - the 2 tiny screws that hold the motor unit in place are very frustrating to work with. Hence only 4 stars. Rated 5 out of 5 by alphabet from Easy to install Took a beginner like me about 1.5 hours to install after removing the old fan. It comes with converter to connect with my 3" duct and electrical wiring was simple to connect. Rated 5 out of 5 by Art Hine from Easy to install & very quiet When I decided to replace an existing bathroom fan, I was looking for a "quiet fan" that had instructions that were easy to follow & install. After reviewing the EZ80NC-EZ I proceeded to install same. It took two (2) hours after removing the old one. The only frustration for me was the short screws that came with the kit. To the manufacturer... supply longer screws (2) required. Rated 2 out of 5 by Showman King from Faulty Fan My biggest complaint about this product is that the included set screws are really small and short. This made the installation so much more difficult than it should have. Keep in mind that when installing a ceiling fan, you are working against gravity, so the small set screws makes it so much harder. Also, after installing the vent mount, I realised the fan was seized and will not spin. Fortunately, the Home Depot customer service let me exchange just the fan unit, and so I didn't have to rip out my freshly installed mount. Rated 3 out of 5 by Richardd from Eazy install - not quiet Install was easy and instructions clear. Disappointed in how noisy it is. Rated 5 out of 5 by Willys from Super easy to install, powerful and quiet I just installed the EZ80NC over the weekend, brilliant design, very easy to install, detailed step by step instruction. Since never done it before, I spent extra time to measure and double check before install, roughly 2 hours from start to finish, all the duct work and wiring can be done without getting up to attic. Finally, the fan is quiet and powerful! Is the fan and the housing IC Rated, I.E. can it come into contact with insulation in the attic?